David and Kate are happily married fiftysomethings when she's diagnosed with early Alzheimer's. He has never been unfaithful, but after several years of losing Kate more each day, he wonders: What is a married widower supposed to do? Two strong-willed women intervene and everyone finds themselves making unexpected choices. Can any marriage withstand the transformation of one partner into someone who's lost? When does a marriage end? The Half-Life of Everything, realistic in every detail except for one speculative twist, places David in the unwelcome situation of loving two women. Must he be the good and faithful husband he's always been, or is he deserving of a second chance? The novel is a modern study of marriage and love--and of friendship, the overlooked foundation of both romantic and everyday life. Deborah Carol Gang's beautifully written, humorous, and ultimately uplifting debut novel will remind readers of Anne Tyler's lyrical and slightly off-kilter fiction. 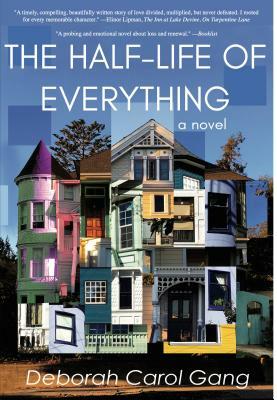 Tyler herself, who steadfastly continues an anti-blurb campaign, wrote the author "to tell you directly how much I enjoyed The Half-Life of Everything." Originally from Washington, D.C., Deborah Carol Gang moved to the midwest for both college (Macalester College) and graduate school (Western Michigan University). She remained in Kalamazoo, Michigan for her work as a psychotherapist and because of her love of Lake Michigan. She now writes full-time. The Half-Life of Everything is her first novel.